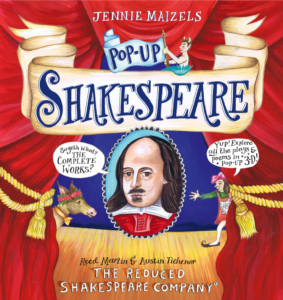 We’re thrilled to announce the publication of Pop-Up Shakespeare, the fun and interactive book for Shakespeareans of all ages, beautifully illustrated by acclaimed pop-up artist Jennie Maizels with text by Reed Martin and Austin Tichenor. Published Fall 2017 by Walker Books (UK/Australia) and Candlewick Press (US), it’s available for pre-order now! Reed and Austin show off the book in the video below. And artist Jennie Maizels flips through the book at high speed, highlighting almost everything you can play with once you get yours! Pre-order yours now in the US! Pre-order yours now in the UK! Hear Jennie discuss creating the book on Episode 541 of the Reduced Shakespeare Company Podcast!